Hop in a car and take a 3-4 hour drive from Nairobi to Mount Kenya National Park. This UNESCO World Heritage site is home to the second highest peak in all of Africa at 17,057 feet. This mountain is extremely sacred to Kenya as it is the seat of the Kikuyu God, Ngai. Even for those not religious, this mountain’s watershed is extremely respected as it produces 70% of Kenya’s hydroelectric power while providing water for half of the Kenyan population. Bring your camera as this park is filled with breathtaking lakes, forests and mineral springs. It is also home to many rare bird species, so keep your eyes on the lookout. Although one might think of Kenya as being hot year round, Mount Kenya has many small glaciers that drop the temperatures to as low as 14F at the higher elevations. Past trekkers recommend avoiding the rainy season and planning your visit during the dry seasons which fall during January - February, and July - October. When looking for lodging in the park, there is a complete range of options for all travelers, from the basics to luxurious. But overall, the further you go up the mountain, the more simple the lodging becomes. At the base of the mountain, Bantu Mountain Lodge is located with 28 spacious rooms and a restaurant within a landscaped garden. Further up the mountain are Mackinder's Camp, Shipton's Camp and Old Moses Mountain Hut, which are more communal, dormitory-style accommodations for backpackers. Make sure to pack a reusable water bottle to stay hydrated as disposable plastic water bottles are not permitted in the park. Tsavo National Park is actually two parks in one, Tsavo East and Tsavo West. Together, they make up the largest national park in Kenya. 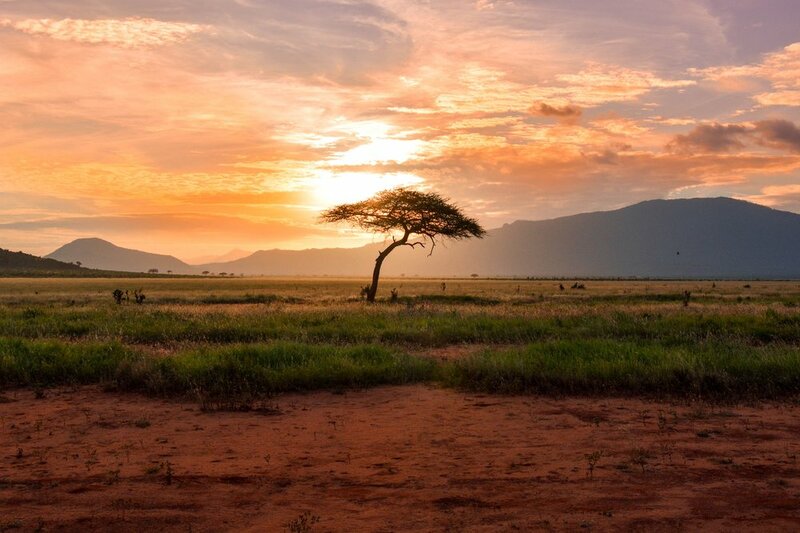 Tsavo East is known to be more accessible than Tsavo West, but also less developed. Tsavo East is opened from 6:30 am to 6:30 pm daily. It is located close enough to the beaches to serve as a one-day safari destination for the visitors who do not want to stay in the park area overnight. If you are lucky you might be able to spot what is referred to as the “Big Five”- buffalo, lions, leopards, rhinos and African elephants. Additionally, other Kenyan animals such as zebras, gazelles, and giraffes also are known to call this park home. Tsavo West has a much more varied terrain than Tsavo East and is home to black rhinos, Grevy zebras, Cosen gerbils, wild dogs, the largest population of red-skinned elephants, and so much more. If looking to do activities other than a safari, Tsavo West also offers hill hiking, caving, and boating. These Kenya national park fees run around $65 USD for adults and $30 USD for children/students. It is best to visit Tsavo East and West during the dry seasons of January-February and June-September. However, if you consider yourself into bird life, October-January are the best months to see Kenya's migratory birds. No matter what animal you are looking to see, the best times to view wildlife are early morning and later in the day, as the animals often sleep during midday when the sun is hot. 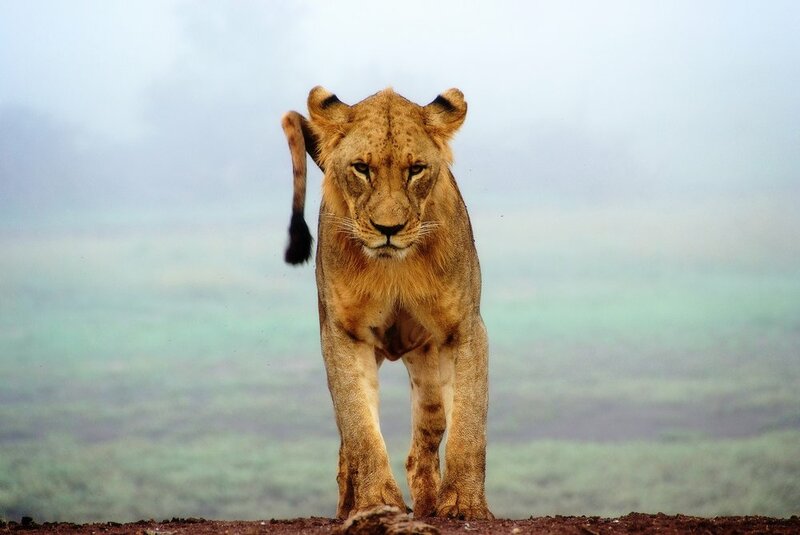 The Masai Mara Reserve is overall the most popular park in Kenya for wildlife. It is very small, roughly the size of Rhode Island, making the concentration of wildlife one of the best. The reserve has no fences allowing safaris to get as close to wildlife as safety and protection precautions allow. The easiest way to access the Masai Mara reserve is from a charter flight from Nairobi or Tanzania since the 6-hour road conditions are extremely poor coming from the capital city. Visit during the prime months of July - October to witness the incredible migration of millions of wildebeest and zebra. During your time at the reserve, consider taking a cultural tour with the Masai village that is located by the Masai Mara National Reserve. If looking for a truly unique experience, hot air ballooning for an hour at dawn over the reserve is a popular option. While these excursions can get expensive, most balloon companies provide a champagne breakfast when landed! If looking to catch a glimpse of Tanzania’s Mount Kilimanjaro without crossing the Kenyan border, head to Amboseli National Park for a breathtaking view of this famous mountain. Aside from great views, this park is also home to more than 50 species of mammal and over 400 species of birds. These species make their home throughout the park's five main wildlife habitats- acacia woodland, rocky thorn bush country, marshland, swamps, and open plains. You can reach Amboseli by a 4-hour road trip from Nairobi or catch a flight from Nairobi’s Wilson Airport. Different from the previous parks, Kisite-Mpunguti Marine National Park and Reserve is marine based on the Indian Ocean. Dhows, the equivalent to traditional sailing vessels, is the prime transportation method through this underwater park. Popular activities include snorkeling and diving among the colorful and vibrant coral reefs below. Keep your eyes out for angelfish, parrotfish, dolphins, manta rays, and turtles swimming below you. This park is located a 1.5-hour drive from Mombasa. Grab your safari hat and binoculars for your next trip to Kenya! Your trip is destined to be an unforgettable, exclusive experience.